Sunday afternoon saw me staring at a big gap where a favourite barbel snag had been all autumn. It had looked pretty permanent, but the power of a flooded River Trent is not to be underestimated. I headed for an area upstream of where I had fished on the Friday. Anticipating a cooler river after two nights frost I was armed with a quiver tip rod and some maggots, just in case. Sure enough the water temperature had dropped to 5.9C. The river looked well, but I didn't manage much. One minnow and a chublet not much larger to double maggot. I switched to a barbel rig with a lump of paste after dark, but it remained unmolested and I headed for home around nine with a ground frost forming. Tuesday afternoon saw me back on the commercial lake after the perch. A chat with the bailiff convinced me to try the area where a good match weight of perch had been caught a couple of weeks back. A worm went under some overhanging bushes over a carpet of maggots, and a maggot feeder bolt rig was dropped straight in front of me a couple of rod-lengths out. It was only fifteen minutes or so before a carp picked up the maggots. A bream followed later, then around four the something started to show an interest in the lob. When a strikeable bite materialised this proved to be from another mirror of four or five pounds. Two days later I was on my way back and called in at a local tackle shop to pick up some red maggots. 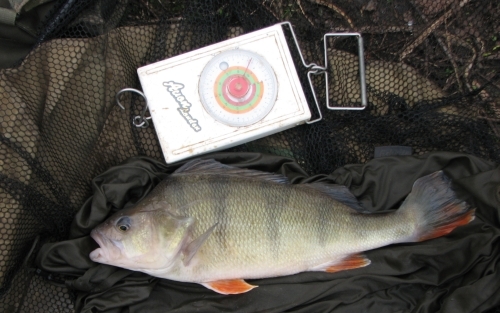 Here I was greeted with the news that the midweek match had been won with a good catch of perch - from the peg two along from the one I had fished on Tuesday. No guesses where I made a beeline for when I saw the swim was free! 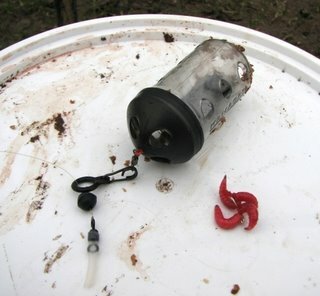 Again I sprayed some maggots close in and this time dropped the feeder rig on them. More maggots went straight out and a lobworm was fished over them. It didn't take long before something started messing with the worm. This had the look of perch activity. Then the maggot rod wrenched round in the rest, and I pulled out of a carp. Fifteen minutes later the maggot rod was away again, but this time the 3lb 12oz hooklink parted. I retackled and continued spraying maggots over both lines. As I did the worm rod kept giving short indications that couldn't be struck at. Convinced perch were responsible I converted the feeder rig from a bolt rig to a running one with a longer hooklength and cast it straight out to the line the worm was fishing. In no time at all a good bite developed and I finally managed to connect with a perch! 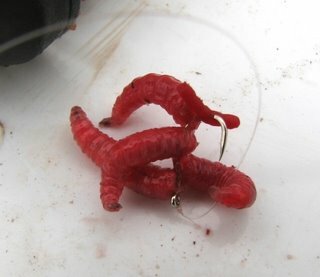 As there is a barbless only rule on the water I was using half an Enterprise plastic bloodworm to keep my four red maggots on the size 14 Kamasan Animal. It was nice to get a decent perch at last. Despite the bailiff telling me the perch were full of spawn this one looked pretty empty, with room to fill out a fair bit over the next month or so.